On Wednesday, the 5th grade students of OLF went on a field trip to the Gulfport Air Traffic Control Tower and GPT Intl Airport to get a first-hand view of the operations. Tim Daigle, air traffic controller, gave the students an inside look at the life of an air traffic controller. During the visit Tim took the students to the top of the control tower to see the controllers land airplanes and monitor the local air space. 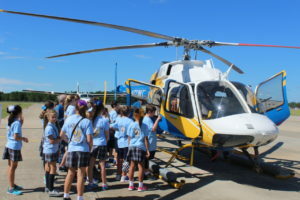 Afterwards the students went to Million Air to see the medical helicopters operated by the Ochsner Flight Care Program and the latest in fire rescue equipment for aircraft emergencies. In the afternoon, Teckie Hinkebein, Director of Marketing for Gulfport International Airport, gave the students a tour of the airport and show them behind the scenes in the operation of running the airport. Ms Cindy Hahn, Principal of OLF, said these field trips are a great way for children to learn more about the local community and be exposed to new ideas for future endeavors.